Decided to do some solo kayaking and push myself for the long paddle into South Bay from Dolphin Cove. I timed myself on this trip and it took me exactly 28mins from the launch site to the mouth of South Bay. The tide was rolling in and the wind was calm. So it made the paddle in quite comfortable. The problem with South Bay isn’t so much the distance but the boat traffic. Even along the shoreline you have boaters buzzing you. Regardless I found my spot and began fishing with no anchor or stake-out stick. Reason being because the wind was calm and I wanted to drift a bit faster to cover more water. After a couple of casts I hooked up to something big. It pulled my line and towed mykayak around with no problem. I got it close to the kayak to see a big flash of copper in the water. My best guess was that it was an over-sized Red. 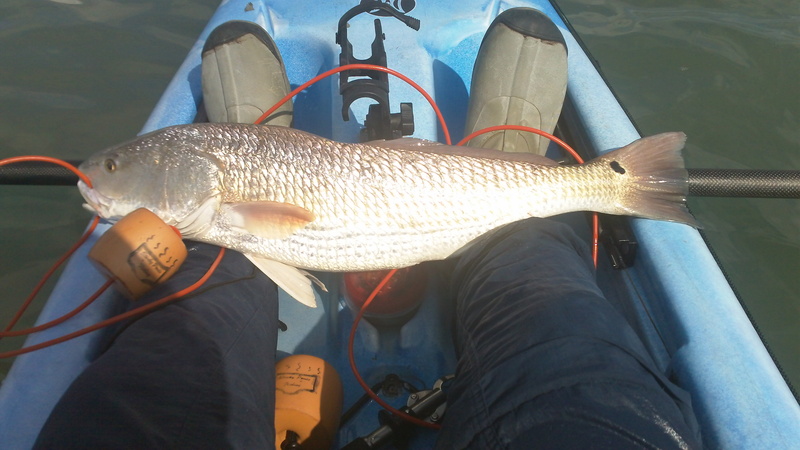 After seeing the kayak the Red took off peeling line heading South. Then all of a sudden it pulled a 180 and swam right towards me. I felt solid tension on the line then nothing. I had lost a big fish. So I decided to continue working the area figuring that there had to be another one out there. Sure enough on my 5th cast afterwards I landed a nice 26in 7lb red. I moved off from that location and decided to fish a spot closer to the mouth. My intention was to pick up some trout with that moving water but the boaters decided to do the same. I quickly had 3 boats around me all each with 4 people on them. With that amount of fishing pressure I decided to just head back to the launch site and call it an early day. The paddle back was a bit rough since the winds had picked up. The way back took me about 45 mins thanks to the incoming water and the winds. Ran into a couple of other TKF kayakers out there who were doing some BTB action. Always good to see other kayakers on the water. I plan on going out again and working the same areas but this time much earlier in the morning.